Thornton Law Firm is pleased to announce that our partner Rep. Garrett Bradley, Esq. 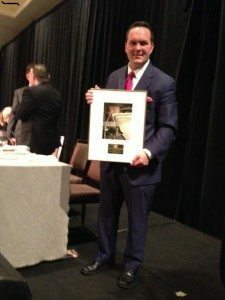 has been named Legislator of the Year by the Massachusetts Bar Association (MBA). Since he was elected to the House in November 2000, Garrett has represented the 3rd Plymouth District in the Massachusetts House of Representatives. The 3rd Plymouth consists of the towns of Hingham, Hull, and Cohasset as well as parts of North Scituate. In the House, Garrett serves as the First Division Chair of the House Rules Committee, a House leadership position, and is also a member of the powerful House Rules Committee. He previously served as House Chairman of the Joint Committee on Election Laws, the Vice-Chairman of the Judiciary Committee, and on the Criminal Justice, Public Service, and Government Regulations Committees. As a state representative, Garrett has fought to secure funds for his district to help the local economy and promote job growth. He was worked to create employment opportunities for veterans and to ensure they get the health care and services they and their families need as they return from war. Bradley has worked on projects that include the Nantasket Beach Seawall Restoration and Hingham Harbor Dredging. In addition, Garrett actively worked with the MBA on medical malpractice legislation. Within Thornton Law Firm, Garrett runs the 6 person team that files claims for thousands of clients in the asbestos bankruptcy trusts. He was chosen by the court to serve on the asbestos claimant’s committee for the Garlock bankruptcy, and also heads the securities financial fraud division of the firm. Prior to being elected to the Legislature, Garrett served as an assistant district attorney in Plymouth County, serving as the lead narcotics prosecutor in the Brockton District Court. Previously he was in charge of prosecuting all cases of domestic violence heard in Hingham District Court. Deeply involved in the community, Bradley volunteers on Hingham’s capital outlay committee, coaches youth football, works on the Hingham community playground project, and supports Wellspring Multi-Service Center in Hull and the Friends of the Paragon Carousel, as well as many other community projects and organizations. Garrett lives in Hingham with his wife Heather and their three children. The award was presented Thursday, May 15th at the MBA’s annual dinner. The keynote speaker was Chris Matthews, political pundit and host of “Hardball” on MSNBC.